Sewer Escape Endless Run - is 3D free run game, or funky race game. Sewer is driving his funky cool vehicles to escape from complicated underground tunnel systems to find exit! Sounds cool? Join us in the run escape journey now! Can you imagine a whole underground Sewer tunnel system? It is like maze, very much complicated, and danger everywhere. You need to be careful to drive through and found your way to the exit. Sewer underground system proves you different vehicles. They are strange in look, but they are real artifact with great looking, you can use any of them, but remember to collect enough cheese to unlock advanced ones. 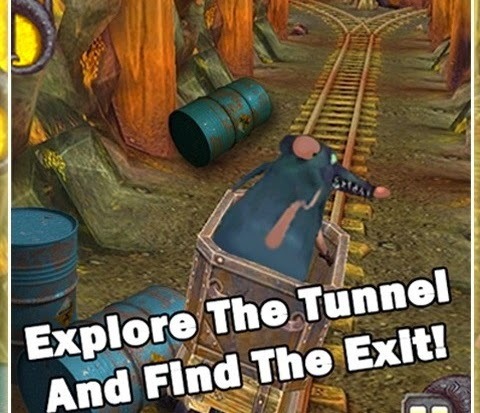 This brave Mouse is very good at driving, running, and mastering the vehicles even in the very much complicated and dangerous tunnels with traps and obstacles. It is really a challenging run game; during the run, you need to collect as many cheese as you can to upgrade your vehicles.